GOODFIELD, IL. 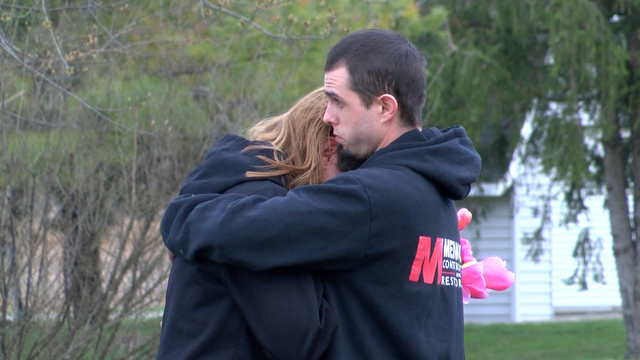 - Community members in Goodfield came together Saturday evening to remember five family members who died in a recent fire. It was an emotional night for those who knew the three children, Damien, Ariel, and Rose Alwood, the father, Jason Wall and the grandma Kathryn Murray, who were victims of the fire. Several people came with flowers and mementos to place around the tree directly in front of what is left of the burned trailer. The family who lost loved ones were given the utmost love, respect and support tonight. A celebration of life will also be held next Wednesday at the Goodfield Apostolic Christian Church Fellowship Hall from 4-to-6 p.m.